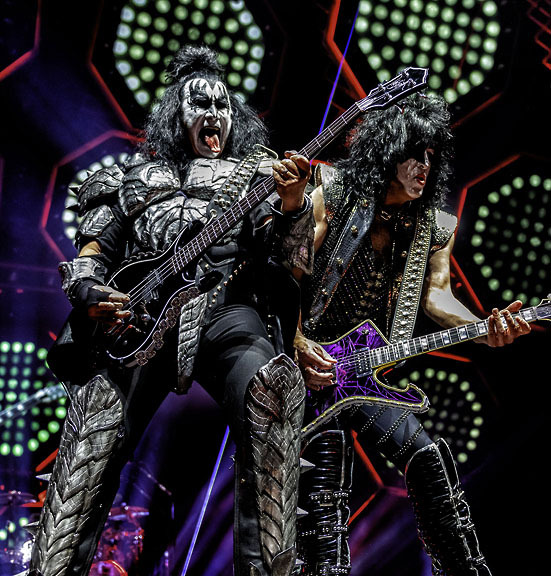 KISS is currently on their "One Last KISS: End of the Road World Tour" and they made their only Arizona stop in Glendale on Feb. 13th. 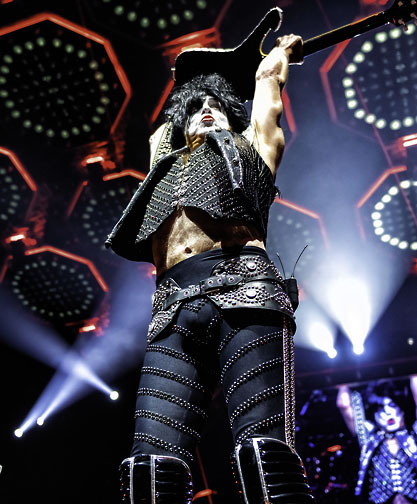 Rhythm guitarist and singer Paul Stanley in a recent interview, promised this would be the "biggest party ever" and the band kept their promise. The KISS Army flocked in to the venue sporting their favorite KISS character makeup and outfits ready for a party of epic proportion. Paul Stanley, Gene Simmons, Ace Frehley, and Eric Carr founded the most unique band ever four decades ago. There wasn't anything like KISS prior to the band. 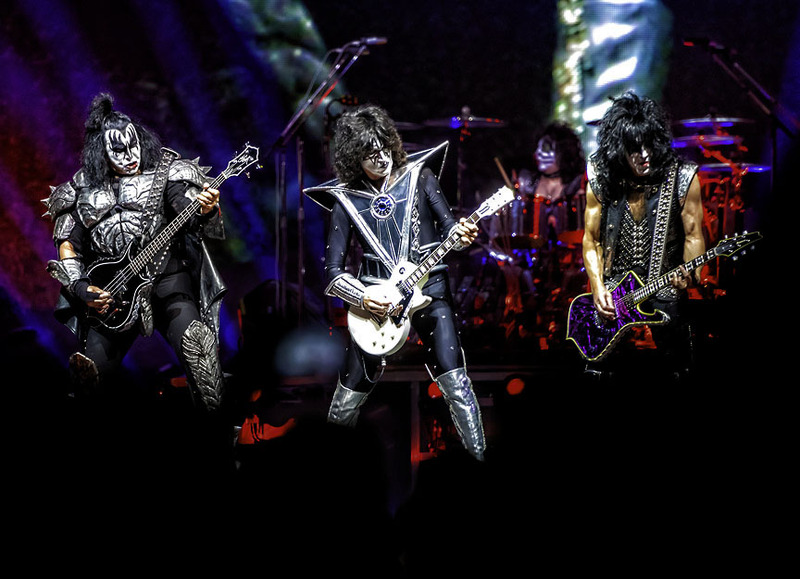 There may be a few imitators, but none have captured that good time vibe and stage theatrics of KISS. The show was a spectacle with the characters they created blowing fire and spitting blood, playing guitars that shoot rockets. The music is upbeat and uncomplicated. The tunes are easy to sing along with and have fun. Two of the original members have been replaced. 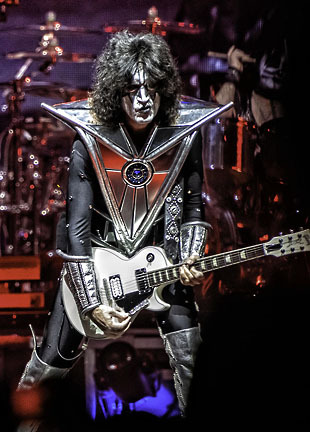 Tommy Thayer replaced Frehley and Eric Singer replaced Criss. Each has carried on the original characters. 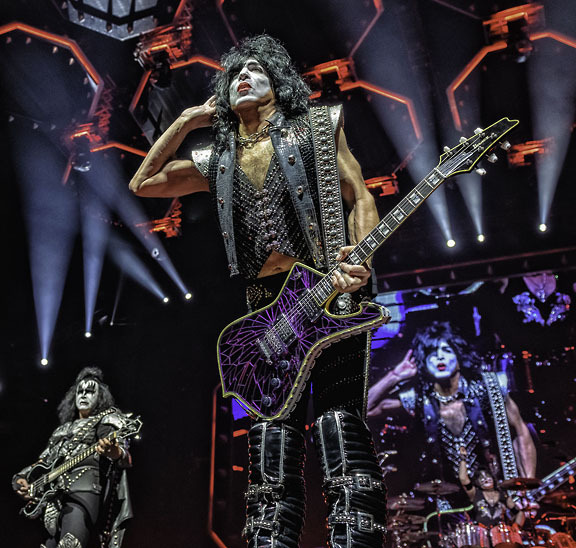 This tour has a new stage with classic videos of KISS performing from the '70s, '80s and '90s in the background throughout the entire show. There were circular lighting displays, streamers, pyrotechnics, confetti canons and explosions. The pyrotechnics were amped up and reinvented this time around. The lighting was astounding. 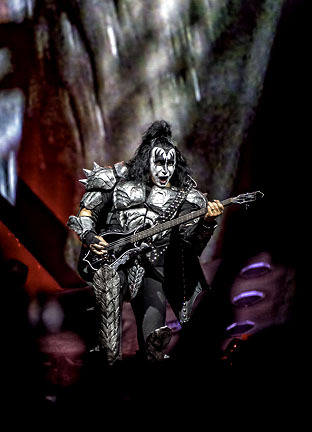 Stanley rode a zipline to a high stage at the back of the arena, singing "Love Gun" while facing his band mates on the main stage. 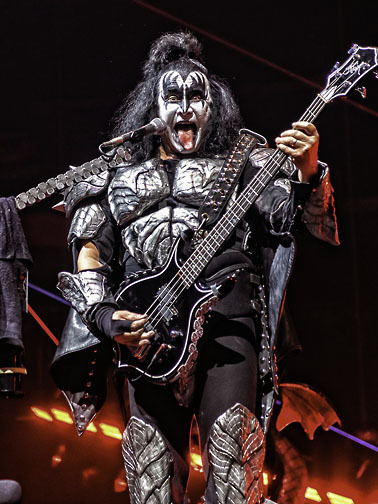 "This is a cool place to be," he shouted when the song was through, "because I can see Kiss!" 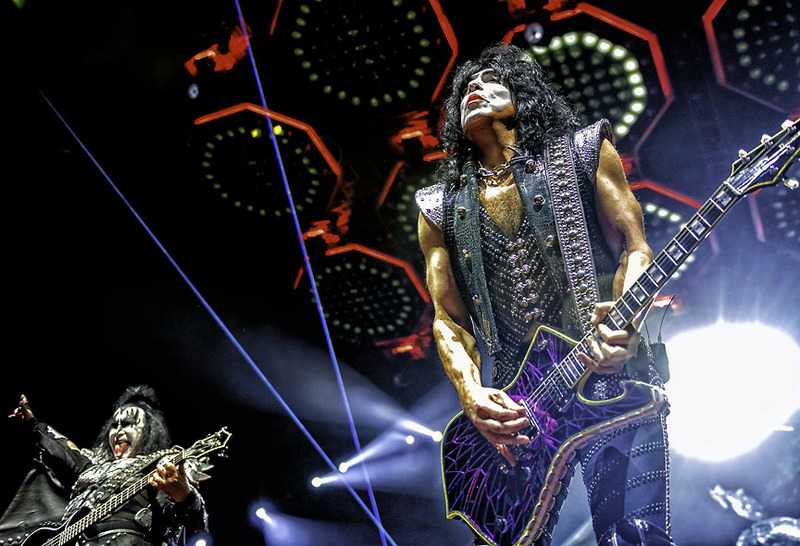 KISS opened with "Detroit Rock City" and they stuck with the '70s classics for "Shout It Loud" and "Deuce" before bringing in the more current tracks from 2009's Sonic Boom, "Say Yeah." They touched on several different eras, providing an overview as they returned often to the early days, including several songs from Destroyer and four from their debut album. There was much critique and discussion of Stanley using vocal reinforcements while singing this tour. There are no vocal acrobatics. That said the vocals and the music sound great. Singer's drum solo is one of the best on "100,000 Years." He is touted as one of the best percussionists in show business. Simmons is still spitting blood to the delight of the fans. He was elevated on a circular panel with his face animated on all of the other circular panels surrounding him. The projections seemed to be live projections. It was an astounding visual experience. The visuals in "God of Thunder" were another highlight of the show. 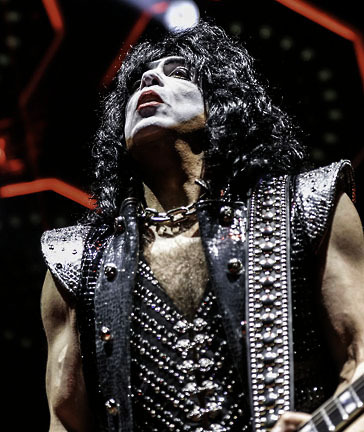 As a horror icon, Simmons' legacy is cemented in the history of rock. There was a lot of good chemistry between Simmons and Thayer during the show. The show did not have the vibe of a roundup of their career. It was more like a good KISS tour not a focus on farewell. They had a farewell in 2000. They may fall into the ranks of Cher who has had several final tours and still going. By the end of the tour, Simmons and Stanley will be in their '70s. They may be tired of strapping on 40 pounds of gear, flying above the crowd in the venue, and singing at the same time. It could be time for the band to do something else instead of touring. 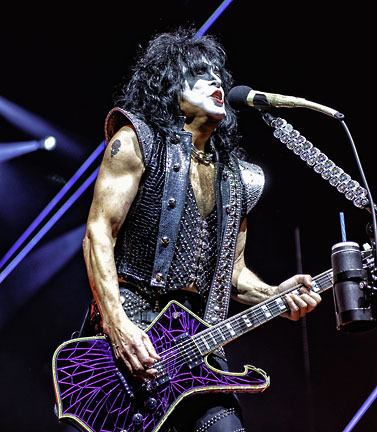 Catch KISS live while you can. They are touring with their best show ever.